Dustin O'Canolin over at UNDRCRWN and online retailer Digital Gravel. More info after the jump. Keep it gangsta. Purchase here. This weekend Serena Williams won the US Open in a nail-biter of a final match, adding to an already monumental year for the powerhouse Tennis champ. in 2012, she also won Wimbledon, 2 gold medals and became only the second woman in history to complete a 'Golden Slam'. With her victory yesterday she also became the first woman to surpass $40 million in winnings. What a champ. To tribute the beast-mode grind of collecting trophies, our sports-loving homies over at UNDRCRWN put together this limited edition, quick strike tee exclusive to DG. 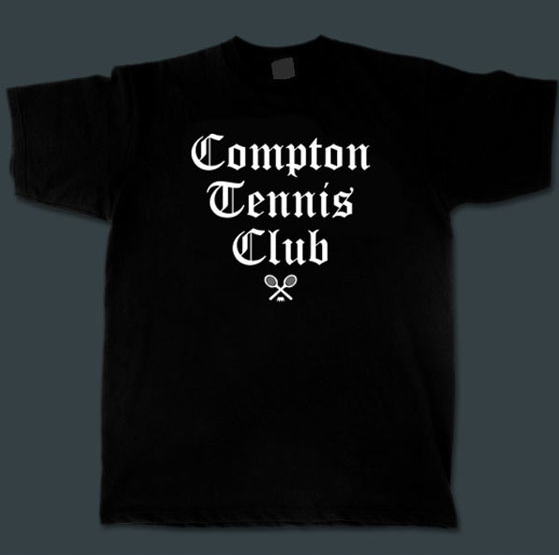 It's a premium black tee topped off with a white print that reads "COMPTON TENNIS CLUB", an ironic, fictional club name since the Williams' sisters grew up playing in the public courts along the streets of Compton. This clean print is done in an Old English font tying it all in together with the obvious reference to the NWA-popularized aesthetic for repping the infamous LA city.